If you’ve seen any footage of the wildfires in BC, you’ll know that it’s smoky and hazy in the Okanagan Valley where I am this week. In fact there’s so much smoke that it has travelled across Alberta and even into Manitoba. 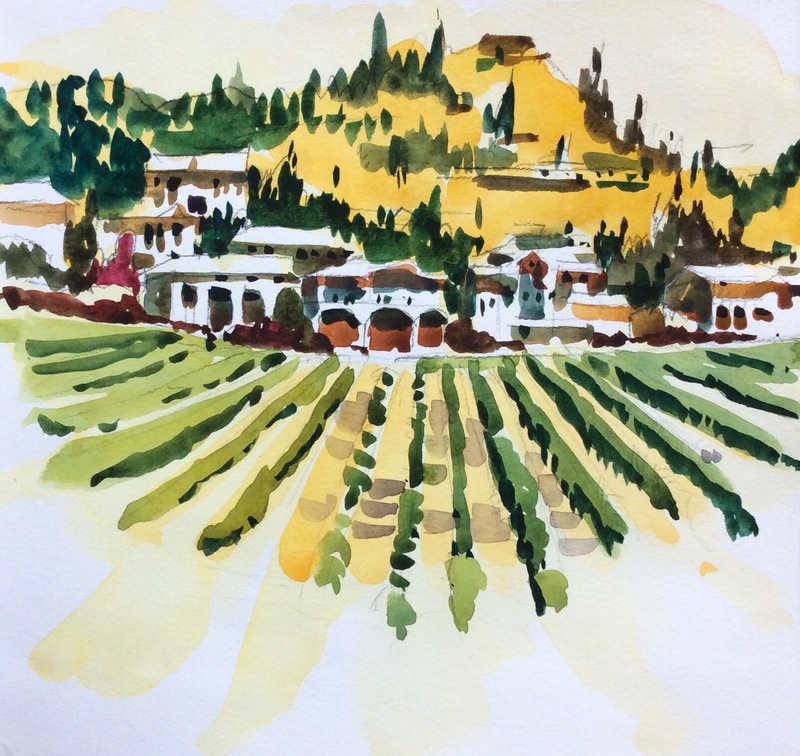 I was planning to paint some large format watercolours this week — views across the lake and over the vineyards — but that is impossible. The air quality is poor and the views are nonexistent. The only thing I did today was a small sketch from Quail’s Gate winery. In a few days I hope to be on Vancouver Island where the air is clearer. In the meantime I am hoping for rain in the interior of BC, and for the people who have been affected by the fires to be able to return home. bad about the smoke! Darn. Hopefully the fires will be under control soon! Yep, skies are clear in our area. Missy, I think the smoke is moving towards the east so you should be fine. Still hoping to paint a large watercolour at some point. There’s a wall waiting for it. You’re in my back yard Shari! So exciting to hear you are in the Okanagan! I know! Our son lives in Kelowna and we are visiting him for the first time. It’s great to be here despite the fires. We are all hoping for rain and cooler temperatures here. Fingers crossed. Sorry to hear you won’t be able to paint some beautiful lake scenes while you are here. Hi Shari, I was just wondering about you and your whereabouts as I watched the news tonight. Glad to know you are in a safe, if smokey, area and heading west. Lovely sketch, great values. Hi Shari, Just wanted to say how much I enjoy your work. Thanks for your consistent blog posts and the instructional commentary. I see you’re on the Island next week. I live in Ladysmith and found your blog through local artist, Alison Watt. Thanks for writing. What a beautiful province you live in! I hope to do a little painting on the Island. It’s a place I’ve wanted to visit for a long time! Stay tuned to see what I sketch there. Wildfires are rampart now. Happens every year but that doesn’t make it any easier. But–your painting–I have been staring at it. Limited palette and unusual design element. Really exceptional. As a BC resident just up the Highway in Salmon Arm, I would like to thank you for your kind wishes towards our residents. I have been an admirer of your work for a while now and was pleasantly surprised to see a post from my neck of the woods. It was special to see your lovely scenes captures to the smoke and haze. Not sure of your plans for the Island, but my personal recommendation is a place called Cathedral Grove. It is a beautiful stand of Old growth forest located between Parksville and Port Alberni about 3/4 of an hour North of Nanaimo. If time permits I would also recommend a visit to Tofino on the far west coast of the Island. I am heading to Montreal on Monday for a week, could you recommend anything of particular beauty that might not be on the list of regular attractions? Stay safe on your journey through what is usually an even more Beautiful BC. Thanks so much for writing and for the travel tips. In fact we will be heading to Tofino, so a stop at Cathedral Grove is now on our agenda. And possibly a sketch too. As for Montreal, you should definitely go up to Mount Royal Park. It’s the most beautiful spot in Montreal with great lookout points to see the city. Of course that is a regular attraction but there’s a reason for that. Old Montreal is also great for wandering the cobblestone streets. And I love the Mile end Streets. You have to stop at St. Viateur bagel for some authentic Montreal bagels. Carre St. Louis is one of my favourite spots for painting. It’s one of Montreal’s most beautiful squares surrounded by Victorian houses. Have a great time in our beautiful city. Your work is so captivating and utterly beautiful. I love the color choice! You got some great skill! My book is now available! Available in stores and through online retailers! Learn how to simplify any cityscape to capture the character of your favourite urban scenes. Learn how to sketch landscapes with confidence using my favourite pen, ink & watercolor techniques. 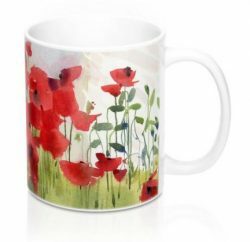 I'm excited that my watercolour "Poppies Today" is featured on merchandise in the Studio 56 Boutique! A selection of my favourite watercolours, mostly painted in and around Montreal.